I’ve worked with a number of domain registrars over the years and have had to navigate through dozens of different control panels in the process. While no interface or check out process is perfect, the control panel I hate using the most has to be Go Daddy’s. Why? 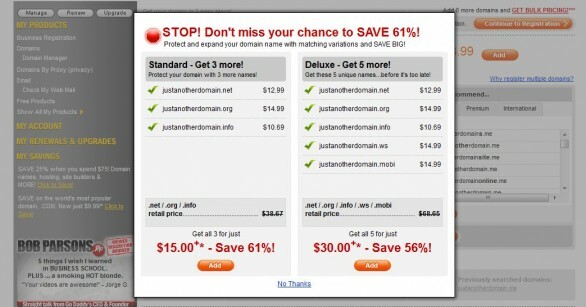 The company barrages me with dozens of special offers every time I register a domain. I know what I want to buy and would rather not be told what I need. I don’t want a .net and .org with my .com, and I’m most certainly not reserving a .name. I’m not doing ecommerce so I don’t need SSL. Getting indexed in Google isn’t hard, so I won’t buy your search engine submission package. Go Daddy should stop overwhelming their customers with “special offers.” Granted, a lot of online stores do this and Go Daddy does offer an express checkout, but even that entails scrolling through a long page of ads. Out of all the registrars, Godaddy is by far the most annoying to order from. And no, a couple of hot girls doesn’t make up for it.